During the last 30 years of his life Frank was known as the father and eventually as the grandfather of Alternative Dispute Resolution (ADR). Frank’s interest in the ADR field developed out of a sabbatical reflection in Sweden. In 1975 Frank was studying the legal rights of co-habiting (e.g. non-married couples). While sitting at the University of Stockholm, he was struck by the contrast between his labor arbitration experience where disputes were resolved quickly and inexpensively outside the courts versus family law divorce disputes in the U.S. where the involvement of lawyers and courts cost families huge sums, often made the situation more adversarial, and didn’t necessarily produce more stable life for the children. Frank put thoughts (what he called “musings”) to paper contrasting the worlds of mediation and family justice centers used more in China or Sweden with litigation and traditional court adjudication used in the U.S. and sent his memo back home to some of his HLS colleagues. One of these colleagues was Bob Keeton, who forwarded Frank’s memo to Professor Leo Levin who was working with U.S. Chief Justice Warren Burger to put on the Pound Conference the following Spring 1976 in Minnesota on dissatisfaction with the administration of justice. The Pound Conference (named in honor of former HLS Dean Roscoe Pound) was sponsored by the ABA, the Judicial conference of the U.S. and the State Conference of Chief Justices. Over time Frank had a vision for how disputes could be more fairly resolved. He was struck by the long waiting time for many court cases and the hardship that this imposed on families with lesser means. 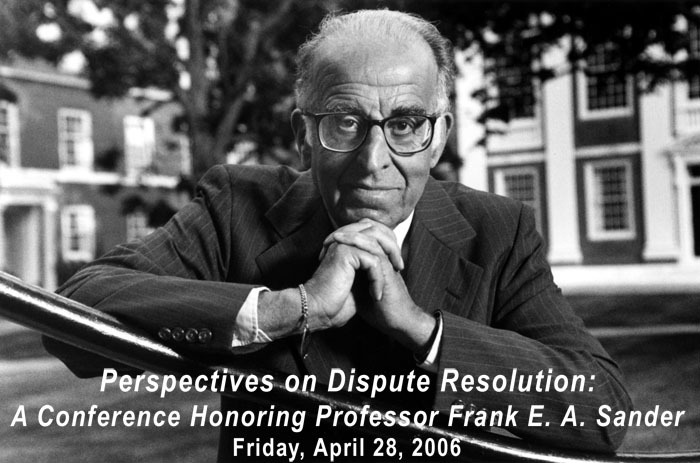 Frank had a vision for how to rethink the way that people settle disputes and how to “fit the forum to the fuss.” Frank’s thinking has had impact not only in this country (with increase in mediation and arbitration and rise of neighborhood justice centers) but across the world. 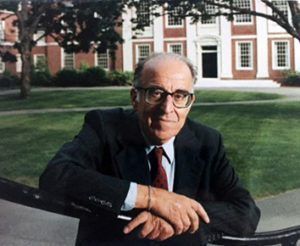 Frank went on to develop a course in Alternative Dispute Resolution at HLS, to chair a special committee set up by the ABA on Alternative Dispute Resolution, and to author many scholarly publications. In 1977 Frank was asked to serve as special consultant to the ABA to assist it in putting on the Conference on the Resolution of Minor Disputes at Columbia Law School. In 1979 Frank co-founded the Program on Negotiation at Harvard Law School with other colleagues. From 1980 to 2005 Frank taught a course in Mediation/ADR for practicing lawyers under the Program of Instruction for Lawyers. Today approximately half of the lawyers coming each year to HLS for continuing education take the Mediation/ADR course. 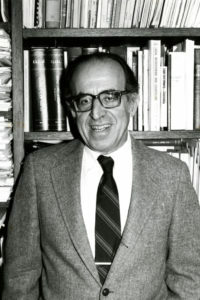 In 1982 Frank ran a workshop at HLS for law professors interested in dispute settlement and published the results in June 1984 in the Journal of Legal Education. In 1984 “The Role of Courts in American Society” was published by the Council on the Role of Courts. In 1987 Frank founded the Senior Mediators Group to give practitioners a place to compare notes and to learn from each other. In 1991 Frank organized a conference at HLS on “Emerging ADR Issues in State and Federal Courts” and edited a volume growing out of that conference which was published by the ABA Litigation Section. In 2006 Frank helped to found the Clinical Mediation Program at HLS. Frank saw the need for writing and text books in the emerging ADR field, developing curricula for current students as well as offering conferences to retrain professionals. 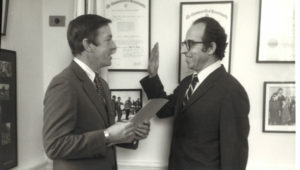 In 1979, with Frederick Snyder, he published through the ABA an extensive bibliography on dispute resolution. 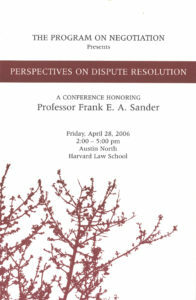 In 1984 Frank put on a conference on “the Lawyer’s Changing Role in Dispute Settlement.” In 1985, with Professors Eric Green and Stephen Goldberg, Frank co-authored “Dispute Resolution” which was published by Little Brown and which won the Center for Public Resources award for outstanding dispute resolution book that year. Goldberg, noted that the three co-authors spent many hours over a month around Sander’s Cambridge dining room table trying to organize and structure a field of study, create some of the problems for the textbook, and draw upon many neighboring fields since the field was so embryonic, with Sander relentlessly encouraging them on. A new edition of the book was published in 1992 co-authored by Sander, Goldberg and Rogers and is now in its 4th edition and used in law schools throughout the U.S. 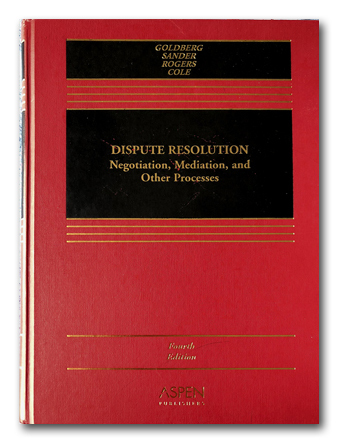 In 1987 Frank wrote “Alternative Dispute Resolution: An ADR Primer.” In 1992 Frank co-authored “Dispute Resolution: Negotiation, Mediation, and Other Processes” with Nancy Rogers and Stephen Goldberg. He collaborated on the 2014 Designing Systems and Processes for Managing Disputes – with Nancy Rogers, Bob Bordone, and Craig McEwen. 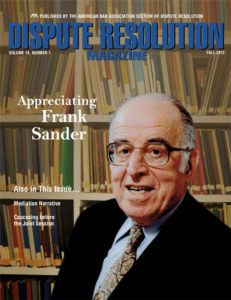 Frank served as the founding Chair of the editorial board for the Dispute Resolution magazine of the ABA Dispute Resolution section from 1994-2012, before becoming Chair emeritus. As the ADR field grew, Frank was asked to play additional roles. In 1990 Frank was named to the Commission on the Future of Mass Courts by Paul Liacos Chief Justice of the Supreme Judicial Court of Massachusetts. Frank’s role was to serve as co-chair of the Commission’s Task Force on Alternative Paths to Justice. In 1990 Frank was invited with Emily to be a resident scholar at the Rockefeller Study Center in Bellagio Italy. From 1994-2002 Frank served as Vice-chair of the Standing Committee on Dispute Resolution appointed by the Mass Supreme Judicial Court as well as a member of the drafting committee of the Conference of Commissioners on Uniform State Law’s project to develop a Uniform Mediation Act, which led to SJC Rule 1:18 the Uniform Rule on Dispute Resolution. Frank spent much time training and exchanging views on ADR with lawyers from around the world. In 1989 Frank was invited by the Law Council of Australia to give a talk on U.S. dispute resolution at the 26th Australian Legal Convention in Sydney. In that same year he was invited to speak on “Institutionalizing ADR: The Newest Challenge” Edward Donley Memorial Lectures at the West Virginia University College of Law. Today Multi-door courthouses and their equivalents are deployed in more than 7 States and various forms of ADR have come to exist in 25 other states/cities as well as a number of other countries including Singapore and Nigeria. Others reflected on how Frank asked tough and probing questions, found weaknesses in research that needed to be addressed, and identified interesting and important topics for others to pursue in ADR.